Successfully Added Portable DVD Player + Terrestrial TV Receiver - Plays DivX to your Shopping Cart. 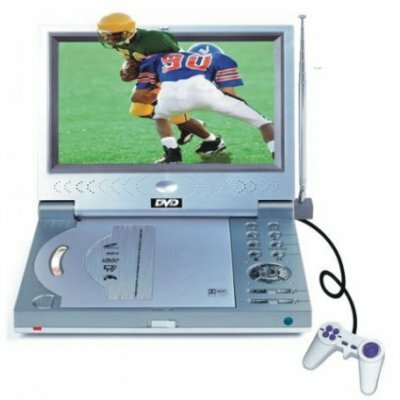 Region-free DVD player with 7-inch full color widescreen TFT. 16:9 - 480 x 234 resolution. Analog TV receiver. Includes NES emulator for playing game ROMs you put on disc; game controller included. USB port for direct connection to MP3 players, digital cameras etc. Direct from the manufacturer in China at the lowest possible wholesale prices. 12 month warranty, no MOQ, dropshipping available - as with all Chinavasion products! Built in rechargeable battery - charger supplied in correct voltage / adapter format for your country. Playback time on battery is two hours. Plays Audio CDs and MP3 /WMA CDs burned from your computer. Also plays videos from disc, e.g. MPG or DivX burned on CD or DVD. Can show slideshows of digital photos. Please use the enquiry ticket system if you have any specific queries about this device.